When asked the primary reason to remember the year 1711, the event probably not on the minds of many is the invention of a device called the tuning fork. The tuning fork has been used as an source of resonating pitch for over three hundred years, and is still used to tune musical instruments today. While the tuning fork was initially applied to tune musical instruments, the concept of resonant frequency of a material or object has been utilized in numerous commercial, scientific, and industrial applications to provide feedback or insight into a process or operation. The vibrating fork level switch is one such industrial application where resonant frequency is used to deliver a data point or provide a control output for process operation. The operating principle of the vibrating fork is based on the oscillating fork resonating at a known frequency in air when it is set in motion. Upon contacting a medium other than air, the resonant frequency is shifted, depending on the medium contacting or immersing the fork. Typically, fork-type level switches are installed on either the side or the top of a liquid process tank. An exciter keeps the fork oscillating, and a detector circuit monitors fork vibrating frequency, providing a change in the output signal when the frequency changes. Contact or immersion of the fork in liquid will change the fork vibrating frequency sufficiently to produce a change in output signal. Depending on the configuration of the level switch, it can function as a liquid level alarm, or provide a control output for a pump, valve, or other device. Sensor response, the change in fork vibration frequency, is a function of liquid density. Liquids with greater density will generally produce a larger frequency shift in the vibrating fork. The wide use of vibrating level switches across various process industries is a testament to the reliability of the technology. The devices protect against overfill, indicate high and low points inside tanks, and are useful over a wide range of temperatures. 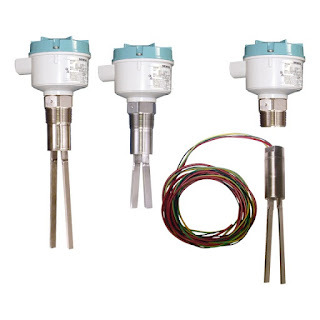 A sturdy design, coupled with product variants that include a variety of sensor materials, selectable probe length, and specialized output features make vibrating fork switches applicable in many operations where level indication is needed. Chemical processing, mining, food and beverage, plastics, and other industries utilize the switches, thanks to their customizable designs and consistent performance. An advantage offered by vibrating fork level switches is a resistance to factors that sometimes confound other technologies employed for level indication. The devices will reliably function despite flow, bubbles, foam, vibration, and coating complexities related to the subject liquids. Additionally, vibrating fork switches are reliable in both high level and low level indication scenarios. Highly viscous liquids are generally not good candidates for the application of a vibrating fork level switch. Some liquids present the potential for material accumulation between the forks, possibly resulting in poor performance. Both of these limitations are addressed by various design features incorporated by different manufacturers. The SIEMENS SITRANS LVS200 is a vibrating point level switch for high or low levels of bulk solids. The standard LVS200 detects high, low or demand levels of dry bulk solids in bins, silos or hoppers. The liquid/solid interface version can also detect settled solids within liquids or solids within confined spaces such as feed pipes. It is designed to ignore liquids in order to detect the interface between a solid and a liquid. Additionally, the SITRANS LVS200 has an optional 4 to 20 mA output for monitoring buildup on the fork to determine when preventative maintenance should be performed in sticky applications. For more information on any level sensing application, contact Ives Equipment by visiting http://www.ivesequipment.com of calling 877-768-1600.